View of the pavilion outside the entrance of the Ekambareshvara Temple at Kanchipuram in Tamil Nadu. 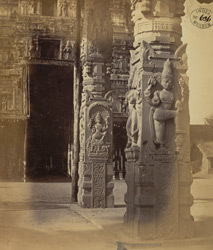 This photograph was taken by Madras School of Industrial Arts around 1868 and is from the Archaeological Survey of India Collections. Kanchipuram was the Pallava capital in the 7th and 8th centuries and continued to be an important centre under the Chola, Vijayanagara and Nayaka periods. The Ekambareshvara Temple is the largest and most important Shiva temple of Kanchipuram which dates mostly from the 16th-17th centuries. It is entered through a tall pyramidal gateway or gopura erected in 1509 by the Vijayanagara king Krishna deva Raya. This gopura is almost 60 metres high and is covered with sculptural ornamentation. It leads to a large courtyard with a "thousand pillar hall" or kalyana mandapa, with richly carved pillars. The tall pavilion seen in this view is situated in the middle of the street that leads to the gateway. Its pillars are also covered with carvings from the Vijayanagara period.